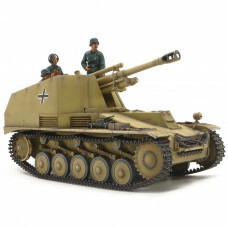 Developed during WWII, the Wespe was based upon the Pz.Kpfw.II chassis and employed the lFH18 10.5cm howitzer, which could propel 14kg rounds over distances of up to 10.6km. Some 676 Wespes were manufactured between February 1943 and July 1944, and they saw extensive use in both infantry support and anti-tank roles, from the Eastern Front across to Normandy and Italy in the West. In January 1944, Allied forces attempted to decisively swing the balance in Italy with landings at Anzio; Wespe self-propelled howitzers were an integral part of the 26th Panzer and 29th Panzer Grenadier Divisions as the Germans responded. This is a 1/35 scale plastic model assembly kit. Length: 143mm, width: 63mm. The compact Wespe form is accurately captured. Open top fighting compartment features parts for rack, radio, ammo and flare cases, and more. Assembly type tracks feature one-piece straight sections. Upper runs depict realistic sag. Comes with markings for 26th Panzer Division and 29th Panzer Grenadier Division. Includes 4 figures total: commander, gunner and two loaders.